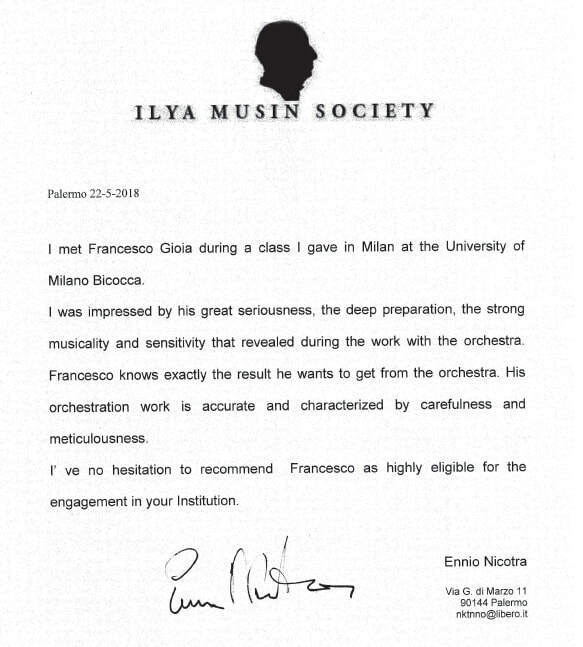 I had the pleasure to meet M° Francesco Gioia in some of my Masterclasses. I immediately appreciated his humanity, kowledge and above all his musical sensitivity, so rare nowadays. His concertations, though very adherent to the composer’s writing, were always personal and convincing. His technique is clear and precise and he always gets concentration and dedication from the Orchestra. He has always been appreciated by the audience as well as by the critics. Because of these talents, I consider him one of the most promising italian conductors of his generation. 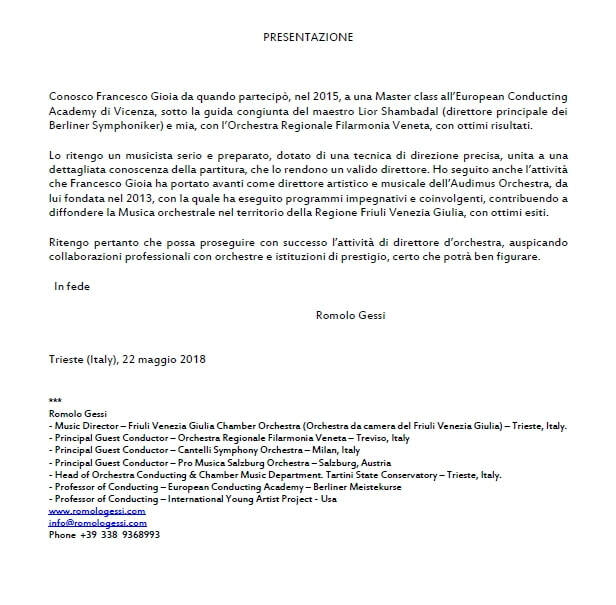 In my long career as the artistic director of “Sintagma Musicum” in Turin, as a musical critic for “Il Nostro Tempo” and as a collaborator of culture department in Turin city council, I had the chance to come accross and know hundreds of musicians (of every orchestral intrument), conductors and singers. When I came back to my birth place in Friuli Venezia Giulia after 40 years, I kept organizing concerts, meeting the “Genius loci”, selecting pianists, violinists, oboists, harpsichord and organ players, etc.. 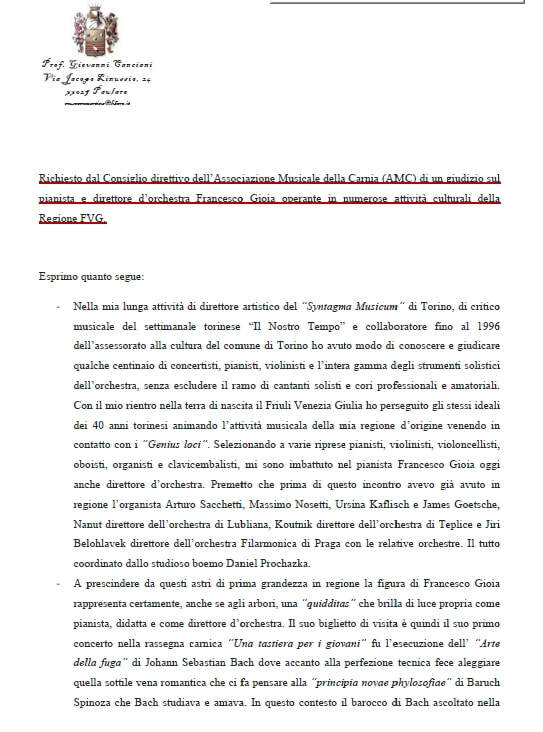 This is how I made the acquaitance of M° Francesco Gioia, pianist and conductor. At the time (2005) I used to work with musicians like Arturo Sacchetti, Massimo Nosetti, Ursina Kaflish, James Goetshe, Anton Nanut (conductor in Ljubliana), Tomas Koutnic (conductor in Teplice) and Jiri Belohlavek (conductor of Praha Philharmonic Orchestra). I was also helped by the Czech researcher Daniel Prochazka. I point out that M° Francesco Gioia’s talent represents a shining “quidditas”, a brilliant shining light. I first came to know him when he performed the “Art of Fuge” by J.S.Bach: Gioia was able to create a subtle lingering romantic idea, leading my thoughts to the “Principia Novae Phylosofiae” by Baruch Spinoza, truly beloved by Bach. You could sense that feeling of torment and ecstasy, of suffering and rapture of S, Teresa d’Avila in the Masterpiece of Bernini, a true anticipation of romanticism. 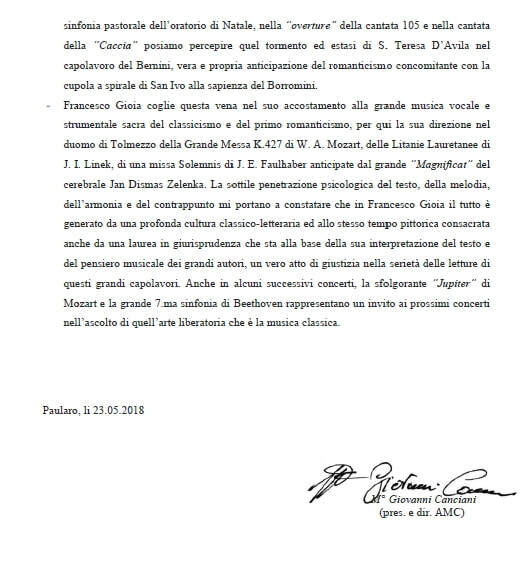 Francesco Gioia shows to understand that “red line” in his performance of Mozart’s Great Mass KV427, Litanie Lauretane by J.I.Linek, Missa Solemnis by J.E.Faulhaber and Missa and Magnificat by J.D.Zelenka. The psychological penetration of the lyrics, of melody, harmony and counterpoint, show clearly to me that in M° Gioia’s mind everything is generated by a deep understanding of classical-literature, helped by his degree in Law that explains his precise interpretation of lyrics and of the great Master’s thought. Ho conosciuto Francesco Gioia in una Masterclass tenuta da me all'Università di Milano Bicocca. Sono rimasto impressionato dalla sua grande serietà, intensa preparazione, forte musicalità e sensibilità dimostrate durante le prove con l'Orchestra. Le sue orchestrazioni sono accurate e caratterizzate da precisione e meticolosità. 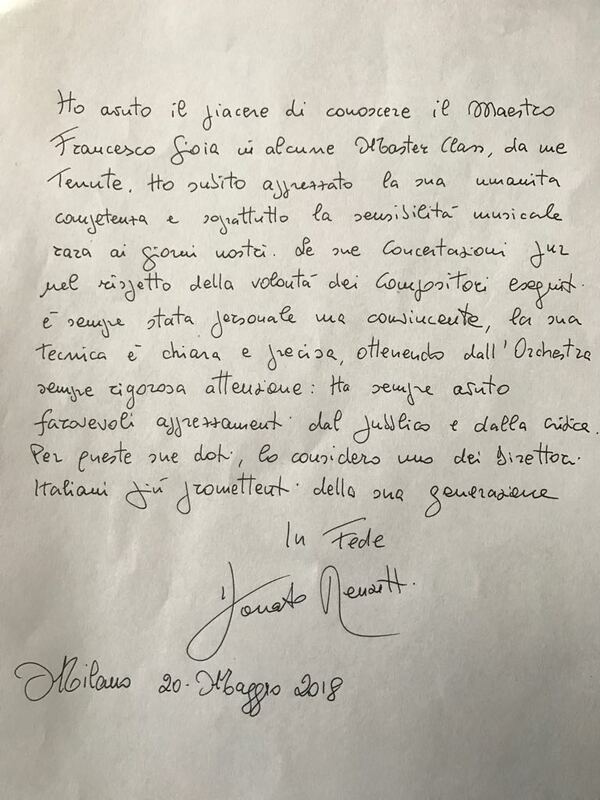 Senza esitazioni raccomando Francesco per un ruolo nella Vostra istituzione. I’ve been knowing Francesco Gioia for three years, since he joined in 2015 a Masterclass of the European Conducting Academy in Vicenza held by M° Lior Shambadal (Principal Conductor of Berliner Symphoniker) and me, with the Orchestra Regionale Filarmonia Veneta, with great results. I consider Gioia a serious and well prepared musician, with a precise conducting technique and a very good knoledge of the score which make him a brilliant conductor. I also appreciated the work of Gioia as the conductor and artistic director of AUDiMuS Orchestra, that he founded in 2013, with which he performed very compelling and charming programmes, giving an important contribution to the cause of spreading orchestral music culture in Friuli Venezia Giulia. I think he can keep succeding in his conducting career, and I wish for Gioia to work with prestigious Orchestras and Organizations, because I’m sure he’ll cut a fine figure. 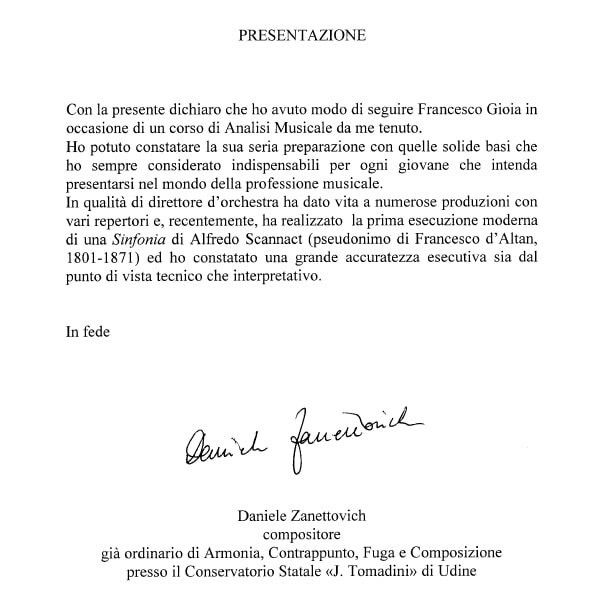 With this letter I declare that I was Francesco Gioia’s analisys and composition teacher. I witnessed his solid competence in all those elements that I consider fundamental for every young musician facing the professional world. As a conductor he worked in many productions with various repertoire, and recently he conducted the premiere of the Symphony “Alfredo Scannact” (pen name of Francesco d’Altan 1801-1871) and I ascertained great accuracy either technically or on the interpretation point of view. 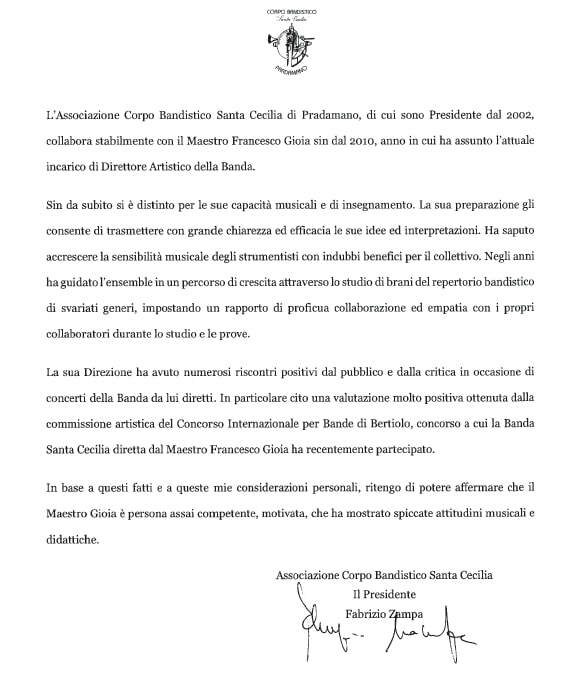 The Association Corpo Bandistico S. Cecilia of Pradamano (wind Ensemble), of which I am the President since 2002, cooperates with M° Francesco Gioia since 2010, when he became principal conductor and artistic director of our ensemble. He immediately stood out because of his musical skills and teaching talent. His knoledge allowes him to share with oustanding clarity and efficiency his ideas and interpretations. He could increase the players’ musical awareness with brilliant improvements for the ensemble. These improvements have been reached through the years facing a wide variety of repertoire and setting an amazing empathy with all the collaborators during reharsals and concerts. His way of conducting was much appreciated by the audience and by the critics. Specifically I want to mention a very positive evaluation given by the artistic jury of International Competition for wind ensembles held in Bertiolo. Due to all these elements I am sure M° Gioia is a very qualified conductor, self motivated, with brilliant musical talents and also great didactic skills. 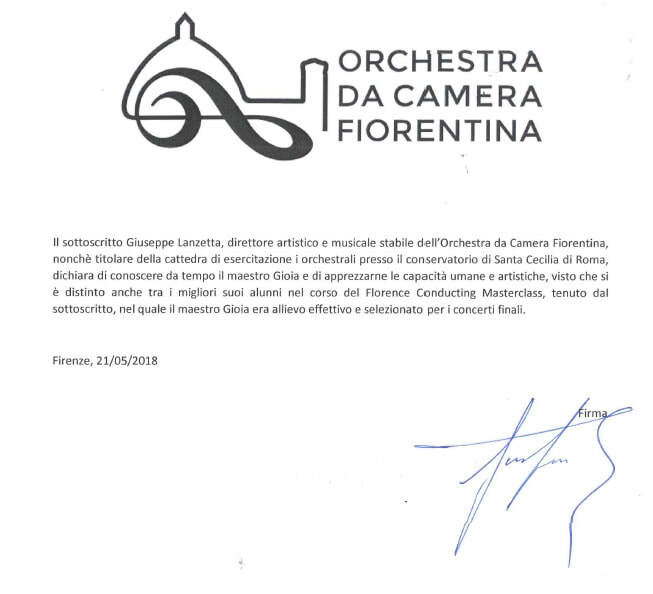 I Giuseppe Lanzetta, artistic director and principal conductor of Orchestra da Camera Fiorentina, teacher of orchestral exercises in Santa Cecilia Conservatory (Rome), have been knowing M° Francesco Gioia for a long time and I appreciate his human and artistic skills. In fact he was one of the best conductors in the Florence Conducting Masterclass, where he was selected to perform with the Orchestra.